Eating a salad each day is a simple lifestyle habit that pays valuable nutrition dividends. What you put on your salad, however, can affect its overall nutrients. 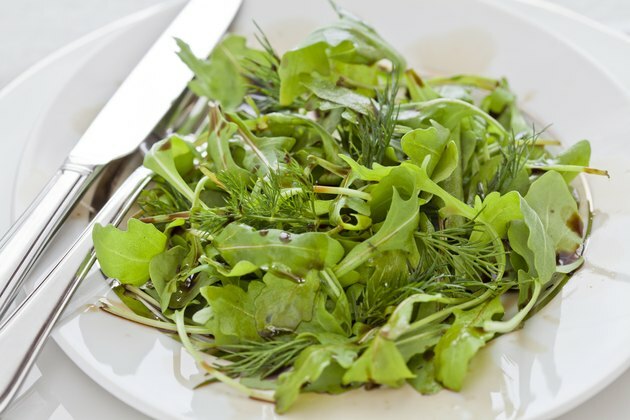 Instead of loading on the high-fat dressings and other calorie-packed ingredients, toss a cup or two of mixed greens with heart-healthy olive oil and vitamin C-rich lemon juice to ensure you get all the nutrient benefits of your small mixed-greens salad. A traditional mixeds-green salad is a combination of different lettuces and other greens, such as romaine lettuce, oak leaf lettuce, chard, endive, arugula, spinach, chicory and radicchio, that are lightly tossed with a favorite dressing. You can purchase and combine the individual greens yourself, and packaged greens are available in "washed," "triple-washed" or "ready-to-eat" varieties. Although washing isn't required for these prewashed greens, it's advisable to pour them into a bowl and remove any leaves that are brown, wilted or spoiled. A small salad is the perfect choice for people who are watching calorie, fat or carbohydrate intake. When averaging the nutrients of a salad made with spinach, romaine lettuce, chard and arugula, a 3.5-ounce serving without dressing provides approximately 21 calories, 2 grams of protein, 0.39 gram of fat, 3.5 grams of carbohydrate, 2 grams of fiber and no cholesterol. Mixed greens are packed with vital vitamins. Including 3.5 ounces of spinach in your salad, for example, provides 28 milligrams of vitamin C, which is approximately 47 percent of the daily value set by the U.S. Food and Drug Administration based on a 2,000-calorie-a-day diet; 194 micrograms of folate, which is approximately 48 percent of the DV; and more than 100 percent of the DV for vitamin A. Vitamin C helps your body make connective tissue, folate is crucial for new cell development and vitamin A is essential for proper vision. Other dark-colored leafy greens provide similar rich nutrient contents. Minerals play an essential role in building and maintaining a healthy body. Adding 3.5 ounces of arugula to your salad provides 47 milligrams of magnesium, which is approximately 12 percent of the DV, and 369 milligrams of potassium, which is more than 10 percent of the DV. Including 3.5 ounces of Swiss chard provides 1.8 milligrams of iron, which is 10 percent of the DV. Magnesium is necessary for many chemical reactions, potassium helps maintain your body's fluid balance and iron helps cells carry oxygen throughout your body.